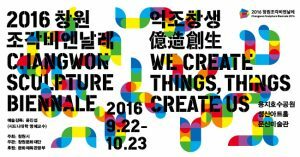 Changwon Sculpture Biennale is an international celebration of sculptures, it established on the opportunity presented by the unification of formerly separate cities Changwon, Masan and Jinhae. It brings a very special art form: the sculptural arts Changwon is the hometown to sculptural history and heritage, home to great sculptors such as Moon Shin, Kim Chong-Yung, Park Chong-Bae, Park Suk-Won, and Kim Young-Won, making this event a meaningful occasion. that is, the Biennale creates a new concept of sculpture. The Biennale considers how to assimilate into the local communities through the prospect of glocalism. The Biennale aims at introducing emerging artists and communicating with local audiences through its exhibitions and programs.